Egyptian horoscope - one of the oldest calendars, reached us. It is based on the mythology of ancient Egypt gods and is built according to the birth date. Due to the fact that the ancient Egyptians carefully monitored its preservation and did not dare to change anything, it remained virtually untouched. Their horoscope consists of 12 signs, each of which embodies its deity, but unlike other horoscopes, each sign refers to several time intervals spaced by the months of the year. In the Egyptian horoscope, the entire annual cycle was divided into small periods of time. Each of them was governed by a deity who not only predetermined the life of a person, but also gave him features of his own character, bestowed secret knowledge, revealed the riddles of controlling supernatural processes. The Egyptian Zodiac includes 12 signs: Nile, Amon-Ra, Mut, Geb, Osiris, Isis, Toth, Horus, Anubis, Seth, Bastet, Sekhmet. Each sign, except the Nile, symbolizes the Egyptian god or goddess. The character of the deity, by whose name the sign was named, was also the character of man. Behavior of man, his features and skills were reflected in the properties of the ruling sign of God. 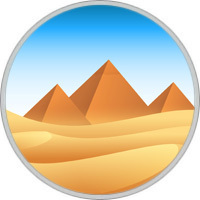 To calculate online your sign on the Egyptian horoscope, enter your date of birth and click on the button. You will get a description of your Zodiac sign and learn compatibility with other signs. Nile Dates: January 1 – 7, June 19 – 28, September 1 – 7, November 18 – 26. The Nile represents the beginning of something. The people of this sign have a very peaceful character and do not like conflicts. Sometimes they can be under the power of passions, but at such times they act wisely. They often change their mood. They can be calm and peaceful, and then suddenly become angry. The people of this sign are excellent observers. They communicate perfectly with other people. The people of the Nile are analysts who like to dream about welfare opportunities, and how to live a peaceful and peaceful life. They like to surround themselves with subtle things. They are attentive to detail and always try to go peacefully. Before continuing any action, they prefer to make sure that everything is safe. These are very practical people. 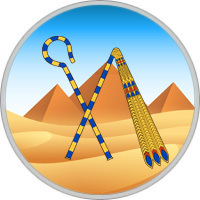 People of the sign of the Nile are serious and choose activities that correspond to their practical, diligent, analytical mind. Amon-Ra is the god of protection and is considered the king of the gods. Those who were born under the sign of the Egyptian god Amon-Ra, talented and optimistic. They become good leaders and inspire other people. In any situation, Amon-Ra people are always confident, and they keep everything under control. Thanks to their optimism, they very often feel happy. They are able to trust their inner voice. They also use their inner voice to help others. They are very successful and lucky. They can make a career as a consultant, trainer or motivational leader, inspiring others to improve. People often come to them for advice. Amon-Ra people make excellent decisions. Representatives of this sign are intelligent and often become leaders. The people of the sign of Amon-Ra are full of wisdom and courage, have the strength of will and diligence. Mut symbolizes woman and mother. In Egyptian mythology, Mut also symbolizes the divine mother, her name means "mother of the world". People born under the sign of Mut are educators and advocates. They tend to become good parents. Often hide their innermost feelings and thoughts, opening only to the closest people. Can be very shy. Only by getting close to someone, they show their knowledge, wisdom and generosity. They clearly know what they want from life, and are focused on making their dreams come true. They know how to attract others with their charm and patience. The people of Mut have a logical, practical way of thinking. They think rationally, so it can be difficult to prove that they are wrong. They are sincere and, nevertheless, mysterious. They are interested in spiritual growth, philosophy and mysticism. 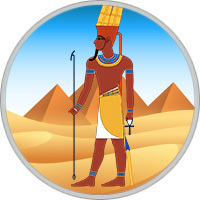 In ancient Egyptian mythology, Geb was the god of the earth. He was the father of Osiris, Seth, Isis and Nephthys. It was believed that from his laughter earthquakes began. 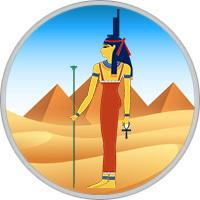 People born under the sign of the Egyptian sign Geb, have a kind heart, possess good intuition. From time to time, they are overly emotional, but this charm and magnetism attracts other people. People born under the sign of Geb, very reliable friends. They can be very sensitive, but they always remain cool and tactful. They are diplomatic, and they always think before acting. They can be shy, but if necessary, they are pretty persistent. They have a good memory and they never forget what other people have done for them. They are attracted by activities that are useful for the Earth and the environment. Professions related to teaching, counseling or literature will suit them. People born under the sign of Osiris have 2 sides of personality. They can be very energetic and strong, but also indecisive. They are successful in new endeavors, optimistic and very generous. Thanks to their intelligence and charisma, people born under this sign can make a successful career in commerce or education. They are born leaders, and confidently use this skill to achieve their goals. They live today and are always full of energy. First of all they think about themselves. They differ in directness in communicating with other people, and always mean what they say. They are very fond of helping others. People of this sign are very independent and do not like to follow someone’s orders. Therefore, it is difficult for them to work in submission. It is best for them to have their own business and work for themselves. 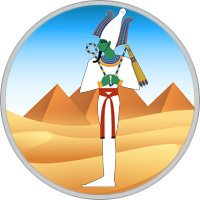 People of Osiris are enterprising, self-confident and purposeful. Isis symbolizes the mother and goddess of nature. She is the patroness of children, the poor and the dead. She is the daughter of Geb and Nut, and sister of Osiris, Seth, and Nephthys. She married her brother Osiris and gave birth to a son named Horus. People of this sign are very frank and straightforward. Some consider them too stupid and open, and others appreciate their direct style of communication. They are looking for a romantic relationship with enterprising and carefree people. They are sociable people who like to give advice to others. The people of Isis have a good sense of humor. People of this sign will not allow any obstacles to stand in their way. They are lucky, and they are able to use all the resources. They can succeed in art, marketing, or entertainment. They work well in a team, and they are very self-sufficient. This makes them popular with friends and fans. 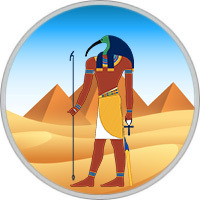 Thoth is the god of the moon, of knowledge and wisdom. He is known as the creator of writing. People born under this sign of Egyptian astrology are able to solve problems perfectly. They like to share their knowledge with others. Naturally, they often become teachers and mentors. They communicate well with people and can become writers or journalists. People of this sign have a good memory, and they never forget someone’s service or a kind gesture. They are always looking for ways to improve. In a romantic relationship, they are honest and true. They are attracted by people with the same values. People born under the sign of Thoth love to receive knowledge, so they can be lifelong students. They are patient, so they are ready to learn if this helps to gain the necessary knowledge. They are very inventive. They always have a lot of new and creative ideas that will help to achieve success in business. Horus Dates: April 20 – May 7, August 12 – 19. Horus, the son of Osiris and Isis, is also known as Hora. In ancient Egyptian mythology, it symbolizes the stars and the sky. He was born after the death of his father Osiris with tal defender of the pharaohs, who united Upper and Lower Egypt. People born under the sign of Horus are very courageous and ready for risk. These are very charismatic personalities. They are always optimistic and will succeed in any profession. These are leaders who motivate and inspire others. Horus people have a strong will and can be stubborn. They put the needs of their families above their own, acting selflessly for the benefit of those they love. People born under this sign are hardworking and get along well with others. They are very practical and intelligent, they will protect those who need it. They can become well-known politicians, public figures and psychologists. In Egyptian mythology Anubis is the guardian of the underworld. People born under the sign of Anubis are very passionate and creative. They are very emotional and sensitive, they usually prefer to work alone. Their emotions can be very unpredictable. Despite the fact that they are introverts, people of this sign radiate confidence that causes respect from other people. They freely express their opinion. People of the Anubis sign are very perceptive and conservative. They are very observant and often know in advance about the thoughts and motives of other people. They are interested in professions related to education and psychology. They never abandon the goal, even if they could not reach it in a few years. People of this sign can be excellent doctors or nurses. In relationships, people of this sign are affectionate and caring. They are happy to take care of their families and homes. Seth Dates: May 28 – June 18, September 28 – October 2. In Egyptian mythology, Seth is known as the god of chaos. People born under this Egyptian sign are always looking for change. They can search all life for adventures and thrills. They set themselves high goals and do not stop until they are achieved. These are leaders who do not like to lose or to be in second place. They always solve problems with determination and perseverance. Seth’s people will not sacrifice their own progress for the sake of everyone else. People of this sign are very sociable and charismatic. They like to be the center of attention. They can become good ministers, motivational speakers or sellers. Seth people prefer actions to silence and solitude. They like to move forward all the time. They are always looking for additional information and knowledge. They tend to become leaders in areas that are not very well known. In Egyptian mythology Bastet is known as the goddess of cats and the goddess of pleasure. It protects women and fertility, as well as love. People born under the sign of Bastet always look for balance and peace. They avoid confrontation and stressful situations. They have very strong intuition and can even be psychics. Intuition allows them to see the true motives of people. 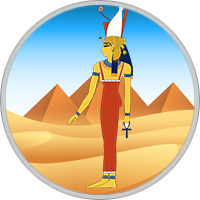 People of the Bastet sign are charming personalities who love to enjoy life. They surround themselves with pleasant things. They are inspired by music and art. In romantic relationships, they are loyal and devoted partners. They are very emotional and sensitive, but also protect those they love dearly. They are affectionate and caring. People born under the sign of Bastet are mysterious, they are attracted by secrets and occultism. Their activities may be associated with occultism or metaphysics. In Egyptian mythology, Sekhmet is known as the goddess of war. She is also considered a healer. People born under the Egyptian Sekhmet badge have a dual identity. On the one hand, they are disciplined and strict. On the other hand, they are free and like to just go with the flow, without any restrictions. They are perfectionists who have a sense of duty and justice. They can become good judges and leaders. 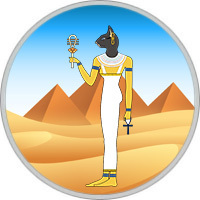 Sekhmet sign people are very professional and able to maintain confidentiality. Many people respect them for discipline and favors. Their main goal is always to keep their pride. For them, this is just as important as achieving the goal itself. Sekhmet people are best realized in power, but they can also become volunteers. They are very optimistic and see something good in all the obstacles. Total - 12 gods for 28 periods of 7-21 days. It turns out that the basis of the Egyptian "god-circle" is the Moon calendar, and the average length of the period for each deity is 13 days (2 weeks or half of the lunar month). Something like the Venusian calendar of the ancient Maya, in which there were 20 months to 13 days - only 260 days. But even more so, it is similar to the ancient Indian zodiac of the 27 lunar Nakshatra camps for 13 days, from which, apparently, the Sumerian took place, passing to the Babylonians (Chaldeans), and then to the Greeks. Which zodiac is more primitive - Ancient Indian or Ancient Greek - is not yet clear. The idea of ​​the patronage of individual gods over people, depending on the day of their birth, may have passed into Christianity in the form of saints and name-days, when each person is patronized by a saint. Now it is connected with the person’s name, but it was originally associated with a birthday in the Orthodox calendar, to which were attached those or other holy saints.